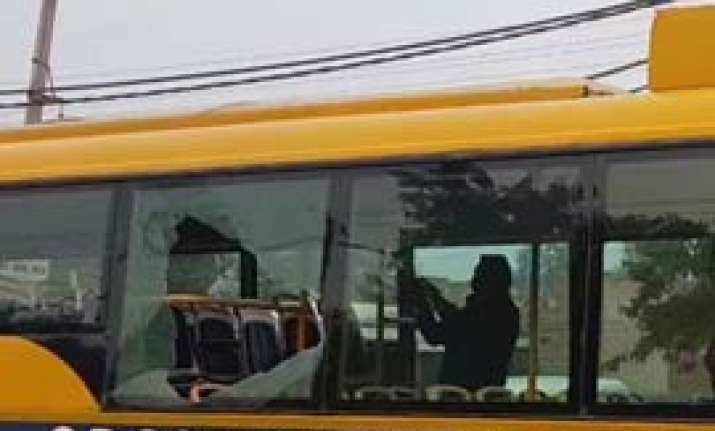 More than a dozen children of the GD Goenka World School were traveling in the bus with teachers and staff when stones were pelted on their vehicle by a frenzied mob on Wednesday. The eighteen accused, arrested for allegedly attack a school bus in Haryana's Gurugram, have been sent to 14-day judicial custody by the Sohna Court on Thursday. Agitators demanding a ban on the film attacked a school bus in Haryana's Gurugram on Wednesday afternoon. More than a dozen children of the GD Goenka World School were traveling in the bus with teachers and staff when stones were pelted on their vehicle by a frenzied mob. However, the driver managed to drive away from the attackers and maneuvered the bus to safety. Bus windows were damaged but students escaped unhurt. In wake of the violence, some reputed schools in Gurugram decided to remain shut till Sunday, including Pathways school, GD Goenka school, Shiv Nadar school and Delhi Public School. Karni Sena denied any role in stone pelting on the school bus, with the fringe group's spokesperson saying "Rajputs can never think of attacking a school bus. This is a plot being created by politicians, who wish to weaken our peaceful protest"
Security forces are maintaining a strict vigil throughout the country, considering the present security scenario in wake of protests.